Rural Action's Environmental Education Program and AmeriCorps members from Monday Creek Restoration Project and Sunday Creek Watershed Group have teamed up with Kids on Campus to provide environmental education activities for Trimble Elementary School students. Environmental Education Program Coordinator Joe Brehm worked with the after school Kids On Campus program to include learning activities centered on the environment and natural systems. The Environmental Club has been meeting once a week throughout the school year and will continue until the end of March. This past Friday's activities focused on food chains. 1st through 4th grade students split into two groups to learn about the progression of energy provided by the sun and how it is passed on to other species forming a continuous chain. The sun provides the energy to make the grass grow, the grass provides the food for energy for the insects, the insects provide the energy for the snake, etc. After learning the basics, the students make dream catchers to represent the food chain they had learned about. AmeriCorps members Elise Gage, Emily Hammon and Leah Graham helped the students with the concepts and assisted with crafting the dream catchers. Rural Action's AmeriCorps program focuses on watershed restoration working with six restoration groups in our region. Providing environmental learning activities with our youth is a big part of their mission to educate and instill stewardship concepts to those residing in our local watersheds. There may be no better way to meet that goal than working with our kids. Learning activities like these will continue throughout the summer, culminating in week long watershed day camps, library programs and other school related activities. 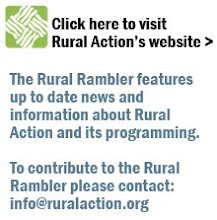 To find out more information about Environmental programming contact Joe Brehm at joe@ruralaction.org.